I grew up in a middle-class home with a country atmosphere near Birmingham. Love made our home. My mom and dad came from large families. They picked cotton and worked to help put food on the table, so most of their siblings did not finish school. My dad got a job at US Steel providing well for our family. My parents always made sure we had the best opportunities they could give us, but education was not emphasized in our house. I knew Mom and Dad wanted us to graduate high school and had told us from time to time how important it was to our future. I believe they didn’t know how to help us fulfill the dream or help us with our homework. My parents always had us in mind and found the best public schools for us to go to. However, none of my sisters or I graduated high school. Like my parents, I struggled with school, but always wanted my kids to get a great education. After not finishing high school, I got married and moved to Huntsville. I got a job at the local K-Mart as a cashier. After working there several months, my boss told us that we were going to have a moonlight madness sale that required us to use old cash registers. We would be left to figure out the final sales price after working out the discounts on our own. I panicked inside knowing I did not know how to do percentages due to my lack of schooling. Luckily, I was not asked to work that night, but it did make me realize that I needed to go back to school. I started taking classes at a local adult education center and met Fred Applegate who worked with me to fill in the missing pieces of my education. I was doing great until Fred left to teach algebra, and the other tutors did not have the patience to teach me. This left me feeling that I could not learn, just like I felt in the past. I always wanted to be a mom and had my son Aaron when I was 21 and my daughter Kylie at 28. As they grew and started school, I always made sure they never got behind, but my own lack of education kept bothering me. 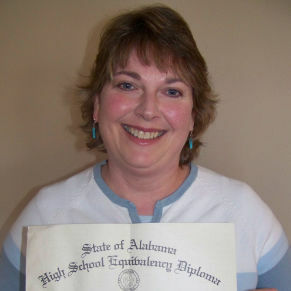 I tried many different ways to get my GED, but none seemed to work for me. My husband and I divorced when I was in my early thirties leaving me a single mom, with no education, and two kids to take care of. I was terrified of not being able to support my kids. A close friend lovingly pushed me to try to get my GED again. I went back to the adult learning center, and Fred was willing to come back and work with me. I began to make great progress and had taken the GED multiple times, passing all of the required areas except for math. I felt so frustrated every time I tried and failed to pass this one area. I must have given up hundreds of times but kept moving forward. I remarried after five years of being single and gained four more children, two boys and two girls. This made me want to pass the GED even more to be a good example to all six of our kids. Christian Women’s Job Corps (CWJC) encouraged me and taught me what I needed to finally pass my GED! A friend suggested I go to CWJC believing they could help me to pass my GED math section. After agreeing to try, I went through my interview with Pat Swinford. I told her that I had told the Lord that this was going to be my last time trying to pass the GED, and then I was giving up. Pat reminded me that I was not God, and to this day Pat and I still laugh about it. I was so tired and frustrated. When I got to CWJC I knew immediately it was different than any program I had ever been to. I remember my first day it was all like a celebration with many cheerleaders surrounding me. They made everyone go outside, take a helium balloon and let the balloon go, saying “goodbye” to whatever was holding us back. I said “goodbye”, but in my heart I did not think it would happen; but I was hoping it would. I began going to CWJC and found several challenges with my self-confidence. When I would feel discouraged, it really helped to be in the encouraging atmosphere of the Job Corps and hear them say, “You could do all things through Christ”. They were always reminding me that I could do this. I had agreed to retake the GED after completing the first section of CWJC. I did not feel completely ready, and it concerned me to try to take the test again. I took the test and waited anxiously for the results to come in the mail. It was so hard waiting! The results finally came, and I had passed my math! The weight of the world came off my shoulders, and I had achieved, after all these years, my GED! I believe the loving care and the amazing encouragement at CWJC was just what I needed to get over my own low self-confidence and pass my GED. In the future I am thinking about going to college and helping others, in my own time, who have struggled just like I did. Thanks so much to Job Corps. I do not think I would have passed without all the encouragement and loving support from everyone!